OK. I admit it. This is a rush job of a post, but if I don't do one now it will be days before I can get to it! I just wanted to share that my Catzee barcode weaving is underway. I used half of the draft for the threading, and the other half for the treadling. I have three colors in the warp, which rotate through the threading blocks. 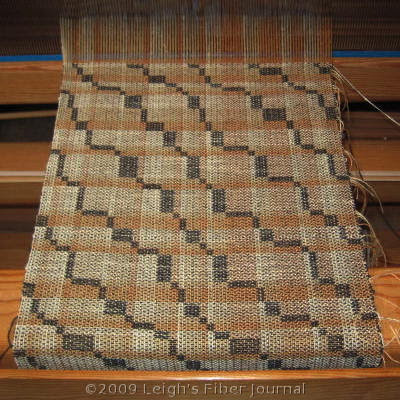 I am using the same three for the tabby weft, changing colors with each block. The lightest color is a slightly slubby rayon and I'm not sure if I like the effect, but oh well. What I do like is the subtle color blending that can be achieved by changing tabby colors. 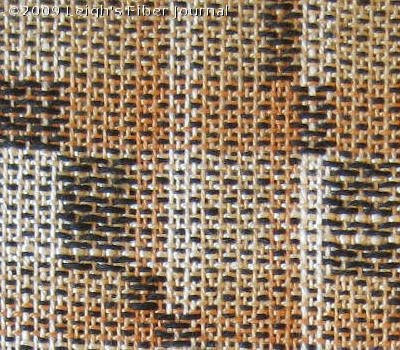 The black pattern weft is only slightly different in size (a 7/2 as opposed to the rest being 8/2s). Now, off I go! I hope you all have a wonderful weekend. Really though, it's absolutely wonderful. You're doing an amazing job on this one. Will it be a runner or fabric to be used later? It's fantastic. I love that you're taking the barcode stuff into the next dimension. I also wanted to ask what you plan to do with the cloth. Better a rushed post than no post at all!! I love the colors. Does that mean I'm fallish or just plain old boring? Anyway they sure do work up nicely in the pattern you've chosen. All your posts are interstiing even the "rushed" ones. Personally, these aren't colors I ordinarily like. I'm a cool color person who lives blues, purples, and greens. Consequently I have to force myself to work with other colors, and for a tortie effect, they are the obvious choices! The fabric is narrow, 10.5" on the loom. One thing it will be for, is my samples for my Complex Weavers Tied Weaves Study Group. They have a sample exchange in May. The rest of it I'm thinking to incorporate into a vest, definitely the fronts, maybe more. That will depend on how much of it I have left, and how wide it is after wet finishing. The widest vest pattern pieces are 9", so it might work! I love the colors and the pattern, they are gorgeous! It's lovely Leigh! I love the combinations. Very cool, Leigh! Good work! Come on over to pick it up. I've just nominated you for the Kreativ Blogger award. Not quite how I expected a bar code design to develop, what fun! Catzee's colours are so lovely. The rhythmic meandering of the black blocks reminds me of the way a cat walks. I love this piece! Beautiful! It does indeed look like a kitty! That pattern would make a very nice rug. Said by a rug weaver who has taken a pause after x number of years of rug making. I agree with Trapunto about the way the cat walks. Gorgeous colors and so much fun. You're killing me here! That cloth is amazing. I hope when I have the chance to try out "Leigh's Bar Code Technique"(insert trade mark), mine will be half as spectacular as yours.